BPT) - Controlling clutter in your home can be a challenge; 48 percent of Americans say their houses are cluttered with stuff they don’t use anymore, according to a survey by ClearVoice Research. Multiple studies have found a cluttered home can negatively affect your mental and physical health, while a cleaner home can make you feel happier and healthier. * Decide what belongs in your entryway and what doesn’t. The size of the space will influence this decision. If your entryway is a spacious mudroom, you might choose to store shoes, boots, umbrellas and backpacks there. If you have a modest foyer, you may decide you only have room for car keys. Remove anything from the space that doesn’t help it serve its purpose in your home. * Add storage/organization that helps the space meet its purpose. Wall-hung key racks can keep important keys at your fingertips. Shoe racks are available in a variety of sizes and styles to fit your space and décor while keeping footwear organized and off the floor. * If space allows, adding built-in storage such as cabinets and shelves can help keep an entry space organized and visually appealing. * Assess the kind of clutter that builds up in your family room. Perhaps your clutter consists of children’s toys, magazines and newspapers, or multiple remote controls for entertainment components. Once you know what kind of clutter you’re collecting, decide if it belongs and must be accommodated, or doesn’t and should go. * Add storage solutions specific to your needs. For example, storage ottomans can double as extra seating and a place to store frequently used toys. A caddy can keep remote controls organized and at hand. * Sometimes furniture that’s too large for a space can add to the feeling of a cluttered and congested room. Assess your family room furniture. Is it the right size for the space, or is it overwhelming the area? Replace overly large furnishings with ones that better fit the room. * If you have the room for it, a large shelving or cabinet unit can help contain clutter. Add decorative containers to help keep everyday items like toys, magazines and other frequently used items organized on shelves. * Tackle the linen closet and trash any partial bottles of shampoo, tubes of toothpaste and towels that have seen better days. Be brutal. If you haven’t used that half bottle of body wash so far, chances are you never will. * Clean out your medicine cabinet. Discarding expired prescription medicines can help reduce the risk of someone accidentally taking the wrong medication. * Showers can be among the most cluttered spots in a bathroom. 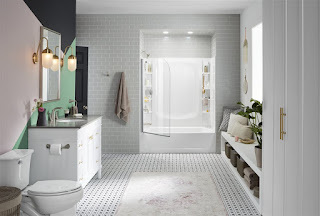 If you’re ready to take your bathroom organization to the next level, ditch the rack hanging from your showerhead and the precarious corner shelving and upgrade your shower to one with built-in organization, like Sterling Store+ shower. The showers feature built-in recesses and tracks where you can snap in a variety of storage accessories and shelves, such as a soap dish, storage bin, towel bar or shower hook. The storage is fully customizable, and all accessories are removable and dishwasher safe. Visit www.sterlingplumbing.com to learn more. * Countertops frequently host a wealth of kitchen-related clutter, from the mail you brought in yesterday and forgot to go through to small appliances you use once or twice a year. Clearing off countertops can make a kitchen feel visually more appealing, look bigger and function better. Remove and store rarely used small appliances, ditch the ceramic container of utensils and store those items in drawers instead. * Pantries and cabinets can be nearly as cluttered as countertops. Adding shelving and storage units within cabinets can help keep pots, pans, lids and dishware better organized and more easily accessible. * Some people need a bit of extra incentive to stay organized. If that’s you, consider replacing solid cabinet doors with glass ones that reveal what’s inside. Knowing the contents of your cabinets are always on display can help inspire you to keep them tidy and organized. Plus, glass-front cabinets are an opportunity to create an appealing visual display.